IN WARTIME, BETWEEN LENIN ELECTRIFICATION AND CHUBAIS ELECTRIFICATION WILL SOLOMON CUT THE BASKET CASE IN HALF*? It was a cloudy day in Moscow last Sunday, September 18, when Russian voters, suffering the effects of two and a half years of American, British, French, Canadian and Australian war, demonstrated what they think of Anatoly Chubais’s electrification. Russian politics — those who voted and those who stayed at home indicated, both — is Putin power plus electrification at a state-controlled price, since the country cannot develop if the Chubaisites pocket the profit and leave ruinous debts behind for the taxpayer to cover. Chubais was President Boris Yeltsin’s chief privatizer of state assets until 1996; then chief of Yeltsin’s near-miss re-election scheme of 1996, and from 1998 until 2008, chief of the state electricity monopoly, Unified Energy System (UES), which Chubais dismantled and sold off in parts. In the process, Chubais, his family, and several of his associates did well. For example, German banking sources remember that in 2008, when Chubais was offering Leonid Lebedev, a junior oil company operator, the takeover of Territorial Generating Company TGK-2, RWE, the German power utility, decided against participating in the privatization. The Germans also refused to provide the cash Lebedev needed for the acquisition. 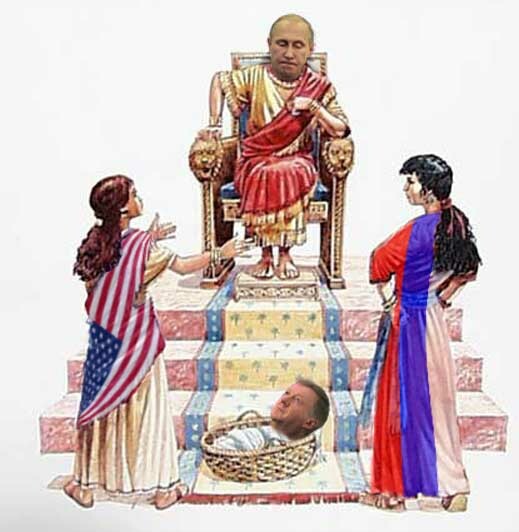 The deal bidding had been rigged in advance, the sources claim, between Lebedev and Chubais (pictured, below left). At the time in 2008 RWE’s Moscow representative was Carsten Weber-Chubays (2nd from left), the German husband of Yulia Chubais (3rd), daughter of Anatoly Chubais’s brother, Igor (right). She had worked for RWE herself. RWE pulled out of the deal, but Weber-Chubays acknowledges that he left RWE to work for Lebedev as deputy director-general of TGK-2. “It wasn’t a genuine bidding process”, says a German source who was close to the business at the time between March 2008, when Lebedev’s Sintez group announced it had won the bidding and six months later, in September 2008, when RWE said it would not proceed. “It was assumed RWE would win,” the source recalls. “Once RWE pulled out, the value of the stake dropped by half or more.” International banks approached by Lebedev for financing refused him. A year ago Lebedev – by then under US protection from Russian prosecutors, who have filed criminal charges — pointed his own finger at Chubais. He was reported as telling Der Spiegel: “In Moscow I discussed the possible business with Anatoly Chubais… He told me that he favours the participation of Sintez [Lebedev’s holding]. To us it was already clear that he had already promised RWE the majority holding in TGK-2.” Lebedev didn’t mention the involvement of the Weber-Chubays couple. Also involved was Valentin Zavadnikov , Chubais’s advisor on the privatization of the UES assets. 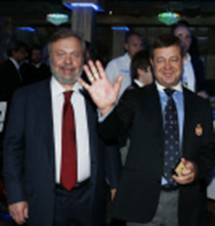 Zavadnikov (right) and Lebedev (left) have been friends, according to Lebedev. Together, they have raced a yacht called Synergy until the money from Lebedev ran out at the end of2014. For this story, click. The stories of the fortunes which Chubais’s associates made at the start of his selloff of the electricity capital are legion. Here’s one about Chubais and Mikhail Abyzov, currently Russia’s Minister of Open Government. But the Chubais electrification failed to preserve the asset value of the utilities, so their privatization debt rose, and profits dwindled. Their managements ran out of money for maintenance; their proprietors have been reluctant or unable to borrow to finance new generating plants. The share prices of the utilities Chubais created for raising capital on Russian and international stock markets have collapsed toward a fraction of their value at privatization. By the free market test, the Chubais scheme provided a windfall for private pockets up front; in time it has proved to be a multi-billion dollar destruction of public asset value. Relatively speaking, the collapse of share value has done least damage to the utilities still owned, directly or indirectly, by the state. InterRAO UES, controlled by Rosneft, has a market capitalization at present of almost Rb318 billion ($4.9 billion); Rosseti’s market cap is currently Rb174 billion ($2.7 billion); Mosenergo, controlled by Gazprom, is worth Rb67 billion ($1 billion); and RusHydro, still state owned, $4.8 billion. If recurring losses and indebtedness are subtracted from their market capitalization, such privately owned utilities as Lebedev’s TGK-2 and Prokhorov’s Quadra are worthless. Still, as the lines in the chart all illustrate, from the start of this year the utility share price trajectory is headed up towards zero-point – that’s the first quarter of 2013, when the recovery of the utilities from the crisis of 2008-2009 peaked. Uralsib Bank reports from the end of March 2013 reveal that InterRAO UES was then worth $5 billion in market capitalization; Rosseti’s market cap was $6.4 billion; RusHydro, $6.3 billion. The downward plunge since then is plain from the chart. Rosseti has dropped by 58%; RusHydro, by 24%. For more on the story of Oleg Deripaska’s attempted takeover of RusHydro, start here. For the details of inside looting at RusHydro by former chief executive, Yevgeny Dod, read this. 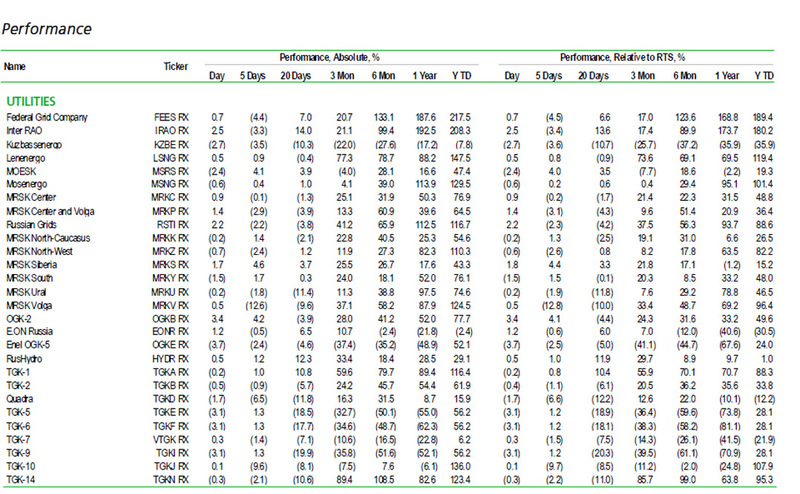 A tabulation of year-long and year-to-date share performance by the listed utility companies, prepared regularly by Uralsib Bank, plots their trajectories against the movement of the overall Moscow share price (RTS) index. Worst performing of the utilities by the RTS measure this year have been Kuzbassenergo (also known as TGK-12); E.ON Russia (also known as Unipro); Quadra; TGK-7 (consolidated in T-Plus); and RusHydro. The owners of these utilities are, respectively, Andrei Melnichenko; the German utility E.ON; Prokhorov, Victor Vekselberg and Len Blavatnik; and the state. Lebedev’s TGK-2 is lossmaking and the target of police raids and court indictments, so its 34% pickup over the RTS index is a puzzle. 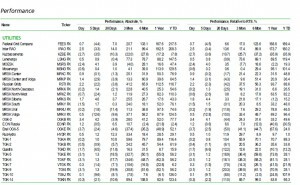 More than a dozen investment banks in Moscow which list analysts as covering the utilities sector were asked for their calculation of market capitalization less aggregate debt for these electricity companies, identifying which are worth more than they owe; which are worth less, and by how much. Not a single analyst volunteered. A search of individual company financials and manual comparison turned up E.ON Russia – renamed Unipro at the end of June — as displaying the largest net value number between a market cap of Rb174.1 billion ($2.7 billion) and debts of Rb26.5 billion ($408 million); that’s Rb147.6 billion ($2.3 billion). For details, read this. As surely as electricity has been converted into Russian aluminium, copper and nickel, and utility debts converted into renationalization of assets, electricity also converts into votes. That’s to say, votes in protest against rising prices, or are they votes in support of a state reversal of privatization?